As technology advances, it’s important to ensure that the senior you’re caring for has access to the things they need such as hearing aids, glasses, walkers and even smart gadgets. You do not have to teach them how to use an iPhone, but instead encourage them to take advantage of what their insurance covers. They may be able to get tablets or iPads that will allow them to communicate with family members and friends. Seniors are often embarrassed to ask for assistance, especially when it comes to technology, so be supportive and make sure they have the tools they need to live comfortably and keep in touch. Promote a healthy sense of purpose by letting them know that they are still needed. Encourage them to volunteer or join groups like book clubs, bridge clubs, church groups or even walking groups. This will allow them to socialize with other seniors and feel like they are offering something to the world. Another way to provide a sense of purpose is through pet care. Many seniors thrive when they are able to care for a pet. Remember, that seniors may not be as able bodied as you are and pets that require multiple daily walks might not be the best idea. However, cats, fish and birds make great pets for seniors. Many seniors do not drive which can lead them to spend most of their time alone. Many provinces offer discounted bus passes for seniors, as well as carpool options. You should ride the bus with them a few times until they feel comfortable on their own. By providing easily accessible and affordable transportation options for seniors, they are encouraged to not only leave the house but to be around other people. This promotes a sense of independence and helps combat social isolation. Many seniors avoid social situations because they have vision or hearing problems. 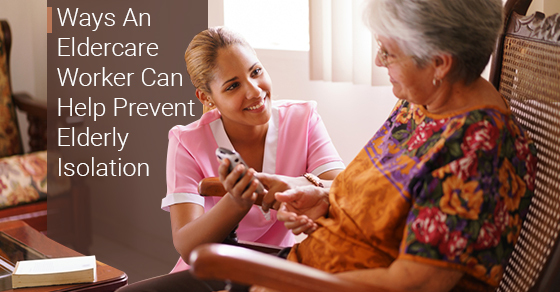 Encourage medical visits so that they can have their hearing and vision checked. Sight and the ability to correctly perceive sound play an important role in how we interact with other people. Seniors are often embarrassed when their hearing and vision start to falter and will avoid visiting doctors and leaving the house altogether. With regular hearing and vision care, seniors will be more likely to socialize and won’t isolate themselves in their homes. Although seniors may have a hard time chewing or require dentures, that does not mean that they should be eating poorly. What we eat influences our mood and if seniors aren’t eating well – or eating enough – it can lead to isolation. Encourage healthy eating habits and you’ll notice a big change in their attitude and a willingness to socialize. Incontinence is common as we age and for many seniors it can provide a great source of embarrassment. They will further isolate themselves to avoid humiliation so make sure that incontinence issues are dealt with and that seniors feel comfortable talking about it. There are medications and garments that can help with incontinence and it’s important that your elderly charge has access to them. When we age, we are less active and this can contribute to weight gain. We may also eat less contributing to extreme weight loss. Poor body image is something that keeps seniors from leaving the house. Encouraging positive body image helps seniors understand that weight loss or gain isn’t a big deal and that they shouldn’t feel self-conscious about their appearance. There are many cosmetic effects of aging that are beyond our control such as wrinkles, grey hair and so on – but that shouldn’t keep seniors from socializing. By helping them build up their self-esteem, you’re keeping elderly isolation at bay. Platonic touching from friends and family can boost anyone’s mood. Hugging, hand holding and even a small pat on the back can prevent elderly isolation. When we are deprived of friendly touching our stress levels go up and we will be more inclined to isolate ourselves. Incorporate hugging into your greetings and goodbyes, as long as the senior you are caring for is comfortable with this, to ensure that you’re helping lower the stress levels of the seniors you interact with. If you do your part as an elderly care worker to prevent elderly isolation, you can ensure that your senior charge can get the most out of their remaining years.